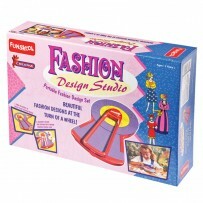 Funskool Knitting Jenny Game Knitting is a task that interests young girls. They like to use their knitting skills to make something productive. The Funskool Knitting Jenny is a knitting kit aimed at young girls who would like to take up knitting as a hobby and later on develop it into personal skills. This knitting set come along with a compact knitting machine that lets you learn the basics of knitting that can later on become a full-time profession like designing clothes. The knitting crafts for kids is an ideal choice for young girls at home.